“Eunice: The Kennedy Who Changed the World” by Eileen McNamara. Simon & Schuster (New York, 2018). 416 pp., $28. “I’ve Been Thinking: Reflections, Prayers and Meditations for a Meaningful Life” by Maria Shriver. Pamela Dorman Books/Viking (New York, 2018). 225 pp., $20. 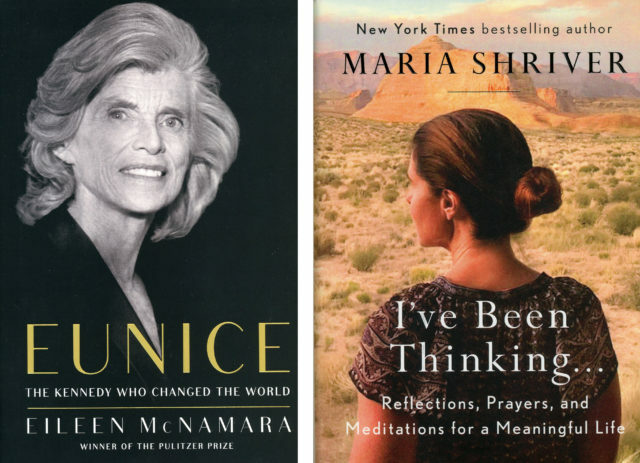 These two excellent books are best read together, starting with McNamara’s insightful page-turner history of the struggles and accomplishments of Eunice Kennedy Shriver, which also includes the achievements of her husband, Sarge Shriver. Full disclosure: I was a friend of Sarge, and had dinner a number of times at the Shrivers’ home, meeting other Kennedys and Shrivers in the process. These family meals interlaced humor and serious discussion of the health and social issues facing our country and how they could, individually and together with others, help those in need. In short, they did not just pay lip service to the social teachings of the Catholic faith, they worked to make the vision of a better world a reality for all. A number of photographs bring the vitality of the Kennedy clan into focus for the reader. McNamara uses Eunice’s personal notes and diaries to bring the story to life. Underlying Eunice’s efforts to help those with mental disabilities was the tragic life of her sister Rosemary. From the family’s travels around the world came the realization that people all over were consigned to poverty and without decent health care. So the Peace Corps was born, a version of which was instituted within the United States as well. Maria Shriver’s personal reflections are best understood within this larger family context, to which she often returns. Each chapter begins with a quotation from people ranging from Mahatma Gandhi, to saints, to people of conscience who lived and are living their faith such as Benedictine Sister Joan Chittister.